Small Bay Villa is peacefully set into the rugged, green hills overlooking the sea in the town of Calheta on Madeira's southwest coast. This contemporary holiday home is bright and airy. Small Bay Villa is peacefully set into the rugged, green hills overlooking the sea in the town of Calheta on Madeira's southwest coast. This contemporary holiday home is bright and airy, with almost every room offering beautiful views across the water. The layout of Small Bay Villa has been designed to maximise its location so close to the sea. Sliding doors in many of the rooms open straight onto the main terrace or balcony, which really brings the outside in. On the ground floor is a lovely, light open-plan living/dining space with patio doors that lead you out onto the terrace. There's a large sofa for enjoying family nights watching films on the flat screen television and a dining table that seats up to six people for meals. The kitchen is fully-fitted and well-equipped with all the amenities you could need. A convenient feature is the separate laundry room with washing machine, ironing board and iron. Also on this floor is the master bedroom, which features a king-size bed, television, ensuite bathroom and terrace access. The most impressive room of all on the ground floor is the spacious games/leisure room. Here you'll find a casual seating area with television, a table tennis table, table games, an exercise bike and some yoga mats. Upstairs are the remaining two bedrooms, with both being of a good size. One has a king-size bed, television and private balcony with seating and stunning views. The other bedroom features two single beds and a television. Also on this floor is a well-appointed family bathroom. The entirety of the outside space is sea-facing and therefore makes the very best of the picturesque surrounding scenery. The terrace is home to a private swimming pool, a selection of sun loungers, a seating area and a portable barbecue. It's the perfect place to end evenings unwinding with a drink as the sun sets over the sea. 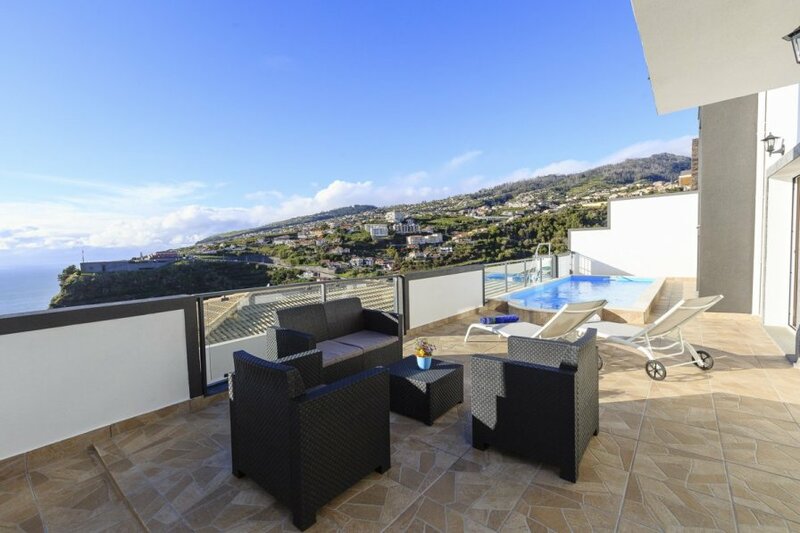 Small Bay Villa is a 3-bedroom villa that has direct views over Calheta. With a private swimming pool and modern facilities, this is an excellent choice for a family holiday. Enjoying such a privileged position within the small town of Calheta means that amenities are on your doorstep at Small Bay Villa. Within a five-minute drive are restaurants, bars and cafes, with the choice increasing the closer you get to the waterfront area. Drive five minutes down to the coast and you'll find one of the few sandy beaches on the island. The sand here was brought in from Morocco, with Calheta being the first place in Madeira to have an artificial beach. The beach is protected by sea walls, making it a laidback place to relax and to go swimming in the calm water. As well as relaxing on a sun lounger and simply listening to the sea lapping the shore, you can also try a variety of watersports. Popular activities include canoeing, scuba diving, waterskiing and windsurfing. Meanwhile, the marina is where you can head out on dolphin and whale-watching boat trips. Other points of interest close to the seafront include Casa das Mudas, a clifftop museum that showcases some impressive contemporary art. Another fascinating museum can be enjoyed when you visit Engenho da Calheta, a working sugar cane factory that shows you how Madeira rum is made. Hiking is another great activity in this area, with the lush, green hills full of trails to follow. You'll come across beautiful waterfalls and all sorts of colourful plants that the island is famous for. Madeira's capital, Funchal, is just a 40-minute drive away. The highlights here include taking the cable car right to the top of a mountain, strolling around stunning botanical gardens and exploring the city's old town area.